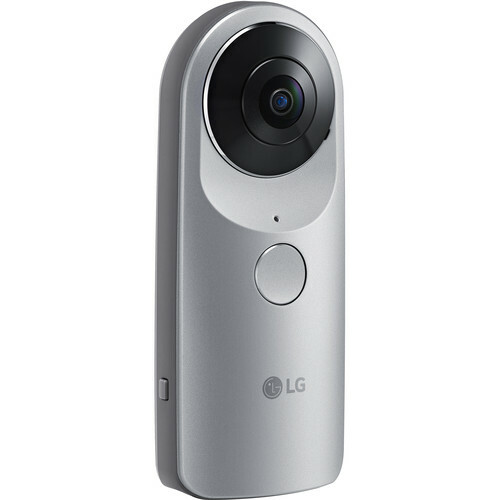 Capture the world around you in all directions with the LG 360 CAM Spherical Camera. This camera uses two 13MP sensors along with two 200° wide-angle lenses to capture photos and 2K video in 360°. Three microphones record 5.1-channel surround sound. Media recorded with the 360 CAM can be uploaded to Google Street View and YouTube360, and are also viewable on the LG 360 VR as well as smartphones and other devices capable of displaying 360° content. It stores pictures and video on 4GB of internal memory, which can be augmented with a microSD card. At the bottom, a 1/4"-20 standard tripod threaded hole enables attachment to tripods and monopods. The 1200mAh battery lets it run without a power source. Box Dimensions (LxWxH) 5.9 x 3.2 x 1.8"
360 CAM Spherical Camera is rated 3.9 out of 5 by 54. Rated 4 out of 5 by BRB 360 from Great Consumer Camera This is a great camera for taking pictures, and a pretty decent camera for taking videos. While taking pictures, there are no noticeable seams, however while taking videos, there is a seam on things that are close up. The camera battery charge hold for upwards to an hour of recording time, while it charges fairly quickly. There is a limit on the recording time of 20 minuets. During playback of the videos, if you watch it on a smartphone, you can use a photo-sphere, but you can't use the google cardboard with it. With a video, you can upload it to YouTube and watch it on a cardboard after, however there are no apps to view it in cardboard. All together though, this is a very good camera for the price. Rated 4 out of 5 by Anonymous from Fun, inexpensive way to play with 360 degree photography This camera has been a lot of fun to play with. It has decent enough image quality (on par with smartphone quality, maybe a little less) for what it is. That being said I think 50MP should be the minimum for 360 degree cameras. Since (at the time of writing) no one makes an affordable 360 degree camera anywhere near that resolution, 360 degree photography will remain a novelty and this suits that just fine for the right price. Video quality is also fine. The Android app works well, though connectivity is not bulletproof. It takes a moment to set up each time, but once the connection is made it really is very good. Rated 3 out of 5 by Eugene from Need software Good camera, well made, acceptable photo and video quality. But uploading to YouTube works properly only when you use LG360 Cam manager for Android. I have tried upload files from PC injected and non-injected and there are big holes and stitches on video. From phone all ok, no holes or stitches. But can you imagine how to work with such huge files on phone? It is absolutely uncomfortable and tooks like hours to upload files via WIFI to phone then to YouTube. I recommend to do not mess with it until any software for PC or Mac will be available. Rated 4 out of 5 by Frank from Great for the price Got the camera around Christmas when the price was reduced by $60. As has been noted by others in comments elsewhere it does not perform well in low light conditions. It selects a 1/30 shutter speed so if anyone is moving there will be a blur. If you switch to the Manual setting you can increase the shutter speed but you also then have to fairly dramatically increase the ISO which in turn will result in a image with more grain. I do like the manual mode as you can perform numerous setting functions like WB, ISO Shutter speed and Exposure compensation. I had a question and called LG Support which is an exercise in futility. The old expression Dumber than wood applies! All in all looks like a fun toy. Back to the Nikons for the serious stuff. Rated 4 out of 5 by Anonymous from Compact, clever and just cool but still a novelty I bought this as a small 'pocket' camera to use on an organized National Parks tour (something to supplement an iPhone camera). And I believe it will work well for that. I'm definitely still learning but consider the camera quirky when linked to a non-LG phone. I'm using an iPhone and need to be WiFi linked to access camera controls and this link needs to be manually reset each time camera goes to standby. As expected, images are great using the LG 360 software app on phone or tablet. The camera is about $200 (the microsdhc memory is extra) which for things photographic isn't really a lot but I'd still have to consider it a novelty. The LG360 CAM is a cool toy but something I could do without. Rated 4 out of 5 by PC Rider from Quick and Easy 360 Panos I waited to buy a 360-cam until there was serious competition. Several new models were introduced at CES 2016 and Mobile World this year, but LG was the first of those to actually become available in stores. It looks much like the (higher-priced) Ricoh Thetas and has very comparable performance (from what I can see so far). Operation is very easy from the Android App, which I am using on a Samsung Galaxy S5 phone. WiFi and BlueTooth connection were easy and quick. The app gives full control over the camera modes and capture, which makes it very easy to take remote 360s while you can step behind a bush or corner to avoid being in the shot. The app has a full preview mode on the screen and can work with preview up to about 25 feet away and without live preview beyond that. Preview works for both still and video images. One shortcoming is that there are no manual exposure controls. Everything is fully automatic, all the time. Without manual controls it becomes impossible to do HDR images, which can be very helpful with the very wide dynamic range that is a natural part of a 360 image. I found from EXIF settings that outdoor exposure was for example: f1.8, 1/3970 sec at ISO 50, while an indoor exposure was f1.8, 1/40 sec at ISO 50. It appears that only shutter speed is varied for exposure. Automatic stitching was very good, but sometimes seams can be visible in architectural images. Total still image size (after stitching) is 5660 x 2830 with a file size just under 5 MB (so there is a lot of JPEG compression going on). Color quality seems pretty good, but bright segments are easily blown-out when there is a wide dynamic range in the scene. Noise and compression artifacts are visible, but maybe slightly less than the Ricoh Theta images I've seen. There is also quite a bit of chromatic aberration visible in the lower portions of the images (looking down). The included snap-on cover is very nice and seems to provide a sturdy protection for the double lenses. VR mode works fine with my Samsung Galaxy phone, so you are not forced to have an LG phone. Overall I recommend this camera for a quick and easy way to capture 360 photos and video. I gave it only 4 stars since lacks any additional exposure control from the app and noise and chromatic aberration were a bit high. Rated 4 out of 5 by Joe Wood from A heck of a camera for the price I'd love to write a comprehensive review, but due to the limited space allowed here, I'll hit the main points. I have this and the Ricoh Theta S. For photo quality, especially in lower light, the Theta is better. Lower res, but clearly and obviously better in most conditions. Stitching on the Theta is much less obvious and often invisible. On the LG, stitching is often noticeable. Not usually terrible, but rarely invisible. For videos, though, the LG clearly wins, even in lower light. Not only is the better resolution obvious, and not only are the mics better (not superb, but... better), but the sharing is so, sooo much better. For example, uploads to YouTube with the LG via smartphone are incredibly easy. With the Theta, it's a pain, and you need to use a computer. Here's a video I posted from my Android smartphone at Disney World's Test Track moments after the ride: https://www.youtube.com/watch?v=BrnWnyEbr0E (be sure to select the highest resolution for the video). The wind noise in that video is understandably bad, but in other situations, sound is pretty good. Stellar? No, but in my opinion as good as the Theta's. The micro SD card is a *huge* plus for the LG 360 vs the Theta's 8GB of storage. The cap on the LG turns into a holder for the camera - excellent. The Theta always feels at risk, but the LG is easily capped when done. However... the indicator lights on the Theta are far superior to those on the LG 360. It is *extremely* difficult to see the lights on the LG in daylight - hard to tell if it's on, hard to tell if you got it to record video, etc. If you're using apps to run them and not doing it manually, it doesn't matter as much, but if you want to just use the camera in hand, the hard-to-see lights are a pain. So: low-light use of the LG, especially for photos, is worse than for the Theta. Stitching is more obvious. Indicator lights are harder to see. But, for basically everything else - ease of use, sharing, video... the LG is better. When will it shipped? Today is 12 May... Almost waiting for 1 month! Paid but still keep waiting for 2, 3, 4 months? Just checking this can rec max 1hr of video but will auto cut off after 20min per clip, correct me if I'm wrong. What is the file size for 20min clip &amp; 1hr clip? Wanted to get either 32gb or 64gb card for this. Each clip is 20 minutes. You can still continuously record but a new file will be created every 20 minutes. The approximate size per 20 minute clip is 3GB. As long as you are running Android 5.0 (Lollipop OS) or later, it would work. What's the time for recording 360 full hd? The camera will only record a maximum of 20 minutes at a time. My recordings (at max resolution) took 2.3-2.4GB for those 20 minute ones. So, *roughly* 8 minutes per gigabyte. For shorter recordings, the sizes varied more, but still took about the same (roughly 1/8 GB per minute). If you lower the resolution, presumably you'd get smaller files, and other factors (how much movement and detail are in the video) also would have an effect (although I'd suspect it'd be minor).To put it another way: you get *about* an hour of video for each 8 GB your micro SD card has. For photos it would be: JPEG. And for video it would be: MP4. When will this camera be available in stock? Is there a limit on the capacity of the micoSD card that it can handle? Currently, it's up to 2TB. is it waterproof or can it be made waterproof? Are there any mounts available?